Overview - Warren Beatty and Faye Dunaway are the legendary Depression-era bandits and lovers in this landmark film that won two Academy Awards and triggered a revolution in screen violence. Arguably the most influential film of the '60s, 'Bonnie & Clyde' redefined the visual grammar and language of modern Hollywood filmmaking. Freed from the rigid constraints of the Hayes Code that had previously anesthetized the "gangster" genre, 'Bonnie & Clyde' lifted the restrictions on graphic on-screen violence and overt sexuality, ushering in a new era of hard-hitting realism. More than just a taboo-breaking footnote, however, 'Bonnie & Clyde' is a masterful examination of violence, infamy, and the American mystique. The film has barely aged in the forty years since it first rocked moviegoers expecting just another rollicking caper flick, and it may in fact be more terrifying in its current cultural implications than it was upon its initial release. The world's first tabloid superstars, Clyde Barrow (Warren Beatty) and Bonnie Parker (Faye Dunaway) embarked upon a crime spree that made headline news in 1930s, Depression-era America. Both came from meager means and small rural towns. Parker sought a life of romance and excitement, and the handsome and charming Barrow was only too happy to accommodate. Like a lit match to a tumbleweed, their chemistry was immediate and combustible, and the pair quickly became involved in the runaway life of bank heists, car chases and bloody, random violence. The story is a well-known piece of revisionist history, but what makes 'Bonnie & Clyde' masterful is not how its plot unfolds (we already know the fate awaiting these thrill-seeking degenerates), but rather the manner in which the film observes Barrow and Parker's amoral behavior and the cultural situation from which it was born. The inevitability of the conclusion generates an almost unbearable tension that would not have been present had the narrative been constructed as something unexpected -- the frequent shots of the couple careening at breakneck speed in their stolen car (just one of the film's many spellbinding visual motifs) become all too symbolic as we wait with bated breath for the collision between their juvenile fantasies and the crushing reality that we know is in store for them. Written with tremendous precision by Robert Benton and David Newman (not a single word is wasted), 'Bonnie & Clyde' tells a very American tale about the yearning to lift ordinary lives to mythic levels. Barrow and Parker may have been psychopaths, but they shared an unquestionable determination to "leave their mark" on the world, and ultimately attain immortality. That they did it by being cop killers and bank robbers was simply due to the fact that they had no other apparent options available to them. That the pair were quickly hailed as misunderstood folk heroes by some (a perception Barrow and Parker were only too happy to foster, by ingeniously stealing only from "rich" banks and refusing to rob from the poor ) only speaks to the way our society has always rewarded ambition over accomplishment no matter what the consequence. 'Bonnie & Clyde' is also a prescient indictment of our culture's continued inability to separate fame from infamy. Barrow and Parker would follow their story in the newspapers with zeal, obsessed with their own notoriety. Their "success" was derived from sheer narcissism, with Bonnie at one point writing a bio of their violent lives that the press was only too happy to publish. (It's no surprise that Clyde makes love to Bonnie for the first time after she writes her opus, directly linking the violence with sexual release -- another taboo the film shattered in 1967). Even more pathetic, the couple's fame would attract their own circle of sycophants. As Bonnie and Clyde became such a hot commodity, their stature would bear "offspring," some who acted as accomplices, some as bystanders, and some who were simply too terrified to turn them in. In just three of the film's many terrific supporting performances, Michael J. Pollard creates one of the most chilling portraits of inept idolatry ever seen on film, while Gene Hackman is indelible as Clyde's brother, and as his long-suffering wife, Estelle Parsons took home an Oscar. Considerable criticism has been leveled at 'Bonnie & Clyde' for Arthur Penn's use of slapstick comedy and often arresting, beautiful imagery to tell his story. Yet that is precisely the point -- Bonnie and Clyde don't exist in the real world, they inhabit an idealized, mythic vision of an America of their own making (never has Depression-era America looked so beautiful). As they rob and plunder, spilling blood across the gorgeous, sun-drenched landscapes, the film achieves a startling and uncompromising thematic contrast. The real and the fantasy worlds collide, unfolding in a comedy of errors that's blacker than black. It's a gritty, complex, and poignant statement, laced with irony, yet never dismissive of the lives lost while Parker and Barrow wasted their own. 'Bonnie & Clyde' continues to probe such incongruities right up to its final, shattering scene. The film's operatic denounement is now legendary, with the lovers gunned down in a hail of bullets aimed at them by the "right" side of the law. That their execution was actually unjust -- they were ambushed by revenge-seeking cops that had no intention of capture, much less a trial by jury -- so muddles the moral ambiguity that it's sublime. Such bold, audacious filmmaking choices elevate 'Bonnie & Clyde' far above the plateau of grand entertainment (which it is) to the that of a seminal landmark. Fiercely intelligent, expertly directed and wonderfully performed, 'Bonnie & Clyde' is one of the must-see films of modern cinema. Minted from a new high-definition master, Warner presents 'Bonnie & Clyde' in 1080p/VC-1 video (framed at its original theatrical aspect ratio of 1.85:1). It is also an identical encode to the recently-issued Blu-ray version. Although the film is certainly of its time, the source has been meticulously restored -- I wasn't expecting such a clean, dirt-free image. Grain is apparent and consistent, but even in dark scenes it's never excessive, adding a gritty, film-like look that is well-suited to the subject matter. While the transfer is not as sharp as a modern film, it's also not "soft," nor is there any irritating edge enhancement. Most improved over past video releases, however, is the color palette. Hues are much more vibrant and smooth (Faye Dunaway's lips look delicious), and fleshtones are wonderfully natural. Detail also exhibits more readily-apparent fine textures, and there is considerable depth for a film from 1967. This new version of 'Bonnie & Clyde' is also a test case for how far the art of digital compression has come in the ten years since the DVD format debuted -- just check out that old disc if you want to see an example of horrible MPEG-2 artifacts and noise, then compare it to this very smooth, very clean VC-1 encode. Needless to say, those weaned only on today's modern CGI spectacles will probably find the look of this transfer archaic. Which is their loss, as even among the already-high standards Warner has set with its past remasters of vintage titles, 'Bonnie & Clyde' looks pretty terrific. Due to the unavailability of the original source elements for 'Bonnie & Clyde,' Warner has not produced a new surround remaster for the film. The HD DVD again mirrors the Blu-ray, and offers only an English Dolby Digital 1.0 Mono track (192kbps). There's little noteworthy about it. As there is no surround presence or even stereo separation to speak of, the action is all from the front. At least the source that Warner did have to work with sounds rather good for a 1967 film, with a decent sense of realism and warmth. I expected worse -- high-end isn't nearly as brittle as other tracks of this vintage that I've heard, and there is a decent amount of low bass. Dialogue can suffer a bit, however, with some low tunes muffled, while louder scenes can grate on the eardrums. All things considered, however, this is a perfectly fine mono track. Warner's original DVD release of 'Bonnie & Clyde' was a bare-bones affair, and the title has long been one of the most requested in the studio's library to receive the special edition treatment. Now, at last, Warner has heeded the call of the film buff, and produced a worthy batch of newly-produced supplements for the film's next-gen editions. Although all of the extras here are presented in 480p/i/VC-1 video only (with optional English, French, Spanish, and Korean subtitles), it's still a fine line-up that should satisfy fans. TV Special: "Love and Death: The True Story of Bonnie & Clyde" (SD, 43 minutes) - Things kick off in somewhat bland fashion with this 1992 History Channel documentary, which really doesn't touch upon the movie much at all. Rather, it's a talking-heads piece with various historians, authors and long-removed relatives to the real Bonnie & Clyde. It provides a good bit of background on the pair (some of which departs significantly from what's in the film), but the pace is rather slow. Documentary: "Revolution! The Making of Bonnie & Clyde' (SD, 61 minutes) - Clocking in at over an hour, the three-part "Revolution!" goes a long way towards making up for the absence of an audio commentary. All of the principals we want to hear from are here, including fresh interviews with director Arthur Penn, screenwriter Robert Benton, creative consultant (aka script doctor) Robert Towne, filmmaker Curtis Hanson, stars Faye Dunaway, Gene Hackman, Michael J. Pollard and Estelle Parsons, and even star/producer Warren Beatty (who in the past has been reticent to take part in DVD extras). There is a noticeable lack of any on-set footage and a limited number of still images, but rather than overload us with film clips Warner focuses on the interviews, which are well cut and informative -- everything from conception to casting to production to release is covered. "Revolution!" is a meat and potatoes doc in terms of form, but it definitely delivers the goods. Deleted Scenes (SD, 13 minutes) - There are only two scenes here, and both without any usable production sound (optional subtitles are provided). But for a film that has been as dissected as 'Bonnie & Clyde' over the years, they are a real find. Also included here are some "Wardrobe Tests with Warren Beatty," which run 8 minutes. Theatrical Trailers (SD) - A teaser and full theatrical trailer are included, both in 480p/VC-1 video and Dolby Digital 1.0 Mono. Collectible Booklet - Finally, 'Bonnie & Clyde' earns an additional note of distinction for being the first of Warner's new line of "Book" special edition high-def releases. Instead of the usual blue keepcase, the disc comes housed in a matted book-like cover, which opens up to reveal 24 full-color pages containing production notes, cast bios, rare photographs, and excerpts from the original theatrical press kit. Although I think the casing itself could be a bit more sturdy (handle this one with care), I did quite like the booklet, which adds a classy, collectible touch. I think Warner is onto something here, and look forward to their future "book" releases. 'Bonnie & Clyde' is one of the best films produced by Hollywood in the '60s, which is more than just high praise -- it makes it a landmark of the medium and a must-see for any serious student of American cinema history. This first-ever high-def release easily does the film justice, with a terrific remaster and a worthwhile package of retrospective extras. Sure, the soundtrack is only mono, but it still sounds as good as it probably could. 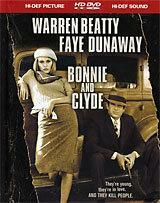 'Bonnie & Clyde' is a must addition to your HD DVD library.